Why I WONT be taking Metformin! So yesterday I went for my GD clinic appointment and growth scan. I came out with box of metformin that I wasn't too happy about being given because I believed that my blood sugars are under control (and they are). When I got home I told Hubby about it and asked what he thought about my decision to wait until after the weekend and be convinced that my blood sugars were in fact NOT fine before I consented to take the meds. He did some research before he gave me an answer. And I'm so glad that he did! Before I go on I need to make it very clear that I am NOT trying to convince other people not to take metformin, or to stop taking it if they already are. I am simply explaining why I am not going to be taking it. You can always speak to your doctor or midwife if you find yourself in my situation and are worried. 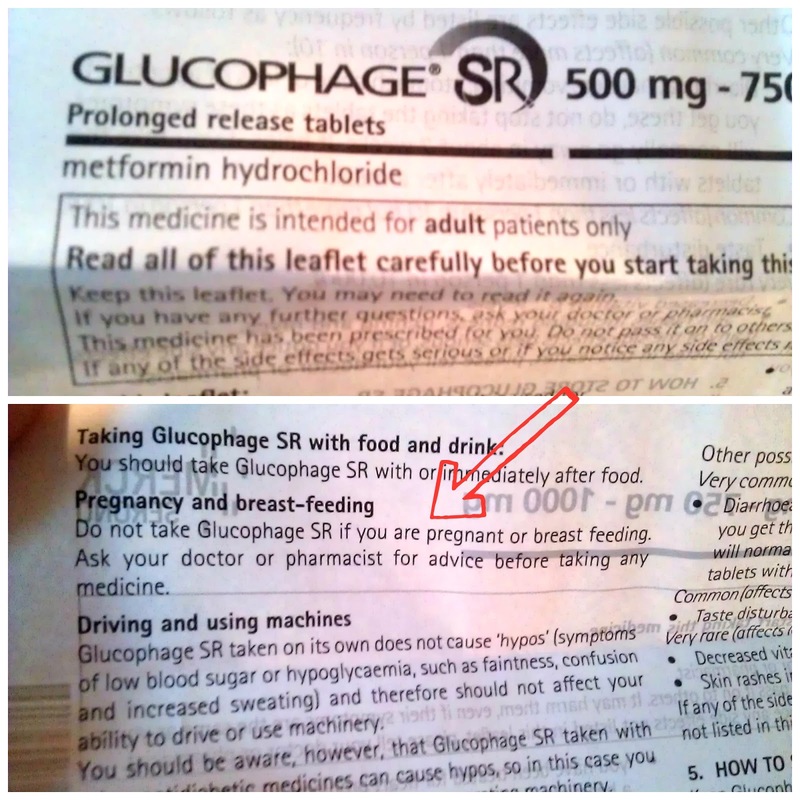 3) This medication is NOT LICENSED for use in Pregnancy either in the UK or USA. Ask yourself why. Now, OK, I will accept that in certain circumstances using a medication which is not licensed for use in pregnancy, but is for other purposes, may be necessary. As Hubby and I both looked into Metformin we've seen that if you are already diabetic or suffer from PCOS (Polycystic ovary syndrome) then it can be beneficial in pregnancy. Which leads me on to my next couple of reasons for me to not take it. 4) I don't have PCOS. Never have had. I was checked out for it back in 2009. A fat Guinea-pig at that. He didn't even tell me it was at trial stage, he just said it was "safe in pregnancy" - so why isn't it licensed for use in pregnancy? I recommend you read the whole article. It mentions one of the things the use of the medication should help to avoid is excess fat on the baby leading to dramatic post birth weight loss etc. Jack DID loose a what seemed like a lot of weight when when he was born. But within the safe parameters. He did not lose a dangerous amount, or even a slightly worrying amount. I wasn''t under the GD Clinic with him and I ate what I wanted (I wanted Jaffa Cakes) He was a big baby at 9lb 13oz. He is still very tall - just like his dad. He is also lean, muscular, fit, and without an oz of excess fat on his entire body! Certainly not obese or diabetic. Yes, if I had not lived off cakes for 9 months he would have been slimmer at birth and lost even less weight. Lesson learned. I know don't eat junk 24/7 while pregnant - that's what my diet control is all about. Without mediation! Tom & George hardly lost ANY weight after they were born at almost 9lb 8oz and 9lb 9oz respectively. I didn't stuff my face with cakes when I was expecting them! They are also lean and fit. Again, diet control. Without mediation! So what is my personal conclusion to all this? Simple! I don't need Metformin. I have NO medical need for it as I am not diabetic or suffer from PCOS. I have NOT CONSENTED to be part of a trial. I have NOT CONSENTED to take an unlicensed medication. I am ALREADY CONTROLLING MY BLOOD SUGAR via my diet and doing an acceptable job of it. And, as I have said countless times in many many places: I HAVE BIG BABIES BECAUSE I HAVE BIG BABIES! Too much sugar in my diet might well make them fat, so I avoid excess sugar. It wont make their skulls bigger, arms and legs longer, or lengthen their spines. So knowing all this, why would I put myself and my unborn baby at risk by taking an unlicensed, unnecessary medication? Just because my high BMI checks a box on some random doctors form? Really? Is that a good enough reason? Not for this mother!